THERAPEUTIC INNOVATIONS we are more than just a massage offers a wide variety of massage therapy services designed to promote relaxation and healing. Our clients, in Philadelphia, Pennsylvania, and throughout the Tri-State Area, are given the right treatment for their specific type of pain. 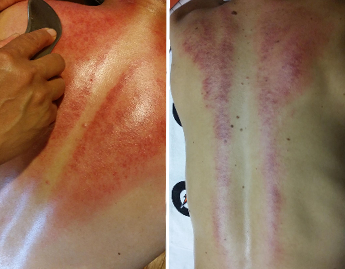 This ancient healing technique tackles chronic and acute pain caused by the stagnation of blood in the affected area. A smooth-edged instrument is used to apply short or long strokes on the skin, typically in the area of pain or on the back parallel to the spine. The goal is to create painless bruising or raised redness (petechiae), which helps promote blood flow and thus pain relief. This deep tissue massage therapy utilizes a variety of strokes addressing ischemic tissue to promote overall relaxation, well-being, and reduce muscle tension. By using warm bamboo and rosewood, we can work deeper with less effort, providing a full body massage.